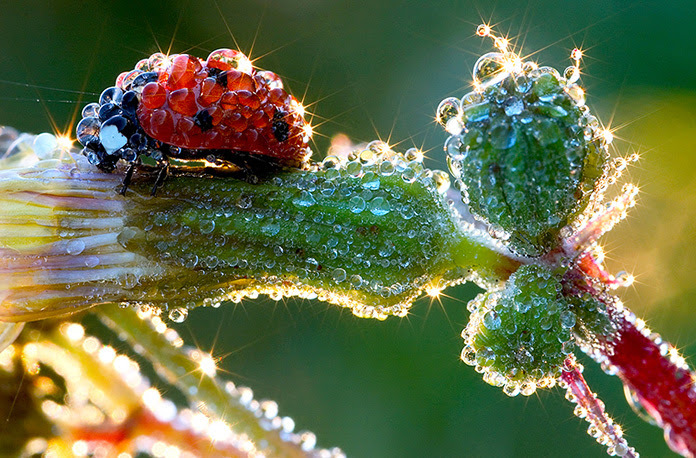 Some viewers have expressed their doubts about the authenticity of this image, assuming the overgenerous dew was produced by a spray bottle, and the unreal sparkles are a bit of retouching magic in Photoshop. Whatever might have gone behind the scenes, this is an image that you can’t look at without feeling a sense of morning freshness. WOAH!!!!! This is the coolest image ever! Even if there was a spray bottle, I don’t care. And sorry, everyone uses PS so we are not allowed to complain about that. Amazing photo! To produce those nice stars, you need a very small aperture, and to get that nice blurry background, you need a larger aperture. So, I guess those stars were added later. The final image is all that counts. The journey that was taken by the photographer may be interesting, but the end result, the final product, is what brings the viewer joy in seeing the image. Whatever was done it is all skill and to know how and lot of talent…i wish it was my image…lol!